Aid agency official: "These people lost their homes, mostly"
If you are being affected by the earthquake, please share your images and info with CNN iReport. 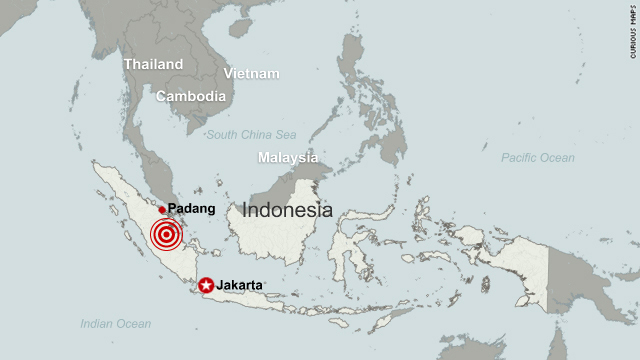 Padang, Indonesia (CNN) -- At least 311 people have died in a magnitude-7.7 earthquake off Indonesia and the subsequent tsunami, said the head of West Sumatra's disaster management agency Wednesday. Another 410 people are still missing, agency coordinator Ade Edward said. Rescuers and aid workers were struggling to reach the victims in the remote, hard-hit Mentawai Islands region of Indonesia. "It's very difficult" to reach the region either by boat or road, said Andrew Judge, CEO of the nonprofit SurfAid International. At least one team, from the Indonesian Red Cross, had to turn back because of high seas. The organization was set to try again Wednesday, taking some 400 body bags, said spokeswoman Aulia Arriani. The trip takes at least 10 hours in good conditions, according to aid agencies. The Red Cross will send more supplies, but is waiting to see what is needed. However, Ita Balanda, a program manager for the World Vision aid organization in Padang, said the urgent needs are expected to be clean water, food, blankets, clothing, medical attention, emergency shelter and hygiene kits. "These people lost their houses, mostly," said Balanda, who is receiving information from the local government as well as a local nongovernmental organization. She said three public schools, a bridge, a road and four churches were also reported damaged. An estimated 7,900 households were affected, she said. Medicines, tents, food and water have been sent to the area by boat, Edward said. "Limited hospital services are overwhelmed," Judge said. "A lot of homes have been destroyed." In Padang, an atmosphere of concern prevailed. Balanda said young people on the street were soliciting donations to aid victims. Mahmuddin Moedpro, a former NGO employee who has mobilized a team of volunteers he calls "a voluntary association of humanity," said in an e-mail he was attempting to get aid to the victims as well. Moedpro, who said he is particularly concerned about the plight of children and pregnant women, said he plans to send supplies, including children's milk, vitamins and food. He said he hopes the government of Indonesia will provide aid and assistance to the victims. Because of the quake and tsunami, as well as the eruption of Mount Merapi in central Java, Indonesian President Susilo Bambang Yudhoyono cut short a trip to Hanoi, Vietnam, and headed for Padang, Indonesia's Antara news agency reported. "The president is deeply concerned over the tsunami in Mentawai and the Mount Merapi eruption," Djoko Suyanto, coordinating minister for political, legal and security affairs, told Antara. The quake struck at 9:42 p.m. Monday, triggering a tsunami warning. Its epicenter was 240 kilometers (150 miles) south of Padang, at a depth of 20.6 kilometers (12.8 miles), according to the U.S. Geological Survey. The magnitude was revised upward from a preliminary magnitude of 7.5. The government issued a warning to people in West Sumatra province to stay alert and stay away from the coastline for up to five days because of the possibility of more earthquakes, Balanda said. CNN's Andy Saputra, Brian Walker and Paula Hancocks contributed to this report.